Com-Pac International, Inc., a leader in the design and manufacture of Com-Pac International has manufactured laboratory specimen handling, storage and shipping products for over 25 years. Due to the recent Zika Virus outbreaks, Com-Pac has added several new specimen handling products designed specifically around the recently provided guidance from the Centers for Disease Control and Prevention (CDC) relating to packaging and shipping these viruses. We have attached several documents on our new zika virus shipping containers as well as the guidance information from the CDC. Specifically, Zika or suspected Zika Virus specimens must be shipped as “Biological Substance, Category B,” and is assigned UN 3373. Shipment of Category B substances must be packaged in accordance with Department of Transportation Hazardous Materials Regulations 49 CFR, Parts171-180. Further, the CDC has specified that specimens should be shipped either frozen (-70ºC) on dry ice or refrigerated (4ºC) on blue gel packs. The packaging requirements for Category B substances is regulated by the Department of Transportation (DOT) in the U.S. and the International Air Transport Association (IATA) internationally. You and your employer can be subject to fines and penalties if the packaging regulations are not followed. All of Com-Pac’s shippers designated for use with Category B specimens have been tested and certified to comply with the UN 6.2 Dangerous Goods Regulations, 49 CFR D.O.T. regulations for air and ground shipments and IATA Packaging Instruction 650. Each of our shippers comes complete with all required absorbents, labels and labeling instructions, and shipping declarations. Com-Pac’s new INFECON® 6200 is comprised of a ½ liter UN certified vessel, bubble wrap, and a carton with the required UN markings to contain the vessel. This vessel will hold up to 6 standard blood tubes. The vessel in its carton is to be placed in the overpack cooler which is also provided, with refrigerated gel packs or dry ice. The INFECON® 6300 is identical to the 6200 except the UN certified vessel has a 1 liter capacity and will hold up to 20 standard blood tubes. It should also be noted on the attached Ebola Guidance Sheet that the CDC reminds healthcare workers that 29 CFR 1910.1030 “requires that specimens should be placed is a durable, leak-proof secondary container for transport in a facility.” The typical bio-hazard bag is not guaranteed leak-proof. However, Com-Pac’s line of Bitran® and Infecon® resealable specimen bags have been independently tested under regulations specifying the definition of “leak-proof” and comply with all such requirements. A must for any zika virus shipping container. On page 2 of the attached brochure, you will find information on each of these specimen bag lines, as well as the new Bitran® Bubble Pouch Bags which combine the leak-proof capability of our Bitran® Bags with a compartmented bubble pouch for safe and convenient handling of specimens within the facility. We have also provided several helpful links to websites which address regulations on specimen handling and shipping. Remember that all of the components of our Zika Virus shipping containers may be purchased separately for refurbishment and re-use. We also specialize in custom bag sizes, printing, sequential barcoding and offer hundreds of other specimen handling and shipping products. All of our products are manufactured in Carbondale, Illinois USA. !! !CLICK HERE FOR OUR ZIKA VIRUS SHIPPING CONTAINER SOLUTIONS!!! International Production and Processing Show this January 27th through 29th, at the Georgia World Conference Center in Atlanta. January 12, 2015 – Carbondale, IL – Com-Pac International, Inc., a leader in the design and manufacture of reclosable packaging solutions, will be exhibiting at the International Production and Processing Show this January 27th through 29th, at the Georgia World Conference Center in Atlanta. Visit us at Booth #B-6655 as our capable team will be available to answer questions and discuss the latest developments in the company’s extensive list of products and capabilities. This year, Com-Pac will be demonstrating our new Fresh-Zip® Zipper-Tape being applied to package film on a Pacmac 9500 VFFS bagger. Our patent-pending design provides twice the product-side opening force for products such as frozen poultry, fresh-cut vegetables, sugar and many other IQF products. Com-Pac will also feature video demonstrations of our Integra® RTR-1000 Pre-Applied Zipper Application System. This system applies zipper to packaging rollstock, creates a tamper-evident opening perforation, and rewinds the zippered film for use on VFFS and HFFS baggers. An additional video demonstration will show Com-Pac’s Integra BP-I backpack zipper application system which mounts directly to your VFFS bagger and applies the zipper to your film web just before the film travels down the fill tube. Be sure to stop by Booth #B-6655 and see the many packages which use Com-Pac zipper and pick-up some samples for yourself! Com-Pac International, Inc., a leader in the design and manufacture of Com-Pac International has manufactured laboratory specimen handling, storage and shipping products for over 25 years. Due to the recent Ebola and Enterovirus outbreaks, Com-Pac has added several new specimen handling products designed specifically around the recently provided guidance from the Centers for Disease Control and Prevention (CDC) and the World Health Organization (WHO) relating to packaging and shipping these viruses. We have attached the two documents from the CDC which provide this guidance. Specifically, Ebola specimens must be shipped as an “Infectious Substance, Affecting Humans, Category A,” and is assigned UN 2814. Further, the CDC has specified that specimens should be shipped either frozen or refrigerated at 2ºC – 8ºC. Enterovirus specimens should be shipped as a “Biological Substance, Category B,” and is assigned UN 3373. The CDC has specified that these specimens should be shipped frozen on dry ice. The above Categories (either A or B) which have been assigned to these substances determines the packaging requirements for each type and is regulated by the Department of Transportation (DOT in the U.S. and the International Air Transport Association (IATA) internationally. You and your employer can be subject to fines and penalties if the packaging regulations are not followed. All of Com-Pac’s shippers designated for use with Category A and Category B specimens have been tested and certified to comply with the UN 6.2 Dangerous Goods Regulations, 49 CFR D.O.T. regulations for air and ground shipments and IATA Packaging Instructions 620 and 650. Each of our shippers comes complete with all required absorbents, labels and labeling instructions, and shipping declarations. Com-Pac’s new INFECON® 6200 is comprised of a ½ liter UN certified vessel, bubble wrap, and a carton with the required UN markings to contain the vessel. This vessel will hold up to 6 standard blood tubes. The vessel in its carton is to be placed in the overpack cooler which is also provided, with refrigerated gel packs or dry ice if you are shipping Ebola, or dry ice if you are shipping Enterovirus. When shipping Enterovirus (a Category B specimen), you must not affix the Infectious Substance label to the cooler, but you must affix the dry ice label to the cooler. It should also be noted on the attached Ebola Guidance Sheet that the CDC reminds healthcare workers that 29 CFR 1910.1030 “requires that specimens should be placed is a durable, leak-proof secondary container for transport in a facility.” The typical bio-hazard bag is not guaranteed leak-proof. However, Com-Pac’s line of Bitran® and Infecon® resealable specimen bags have been independently tested under regulations specifying the definition of “leak-proof” and comply with all such requirements. Remember that all of the components of our shippers may be purchased separately for refurbishment and re-use. We also specialize in custom bag sizes, printing, sequential barcoding and offer hundreds of other specimen handling and shipping products. All of our products are manufactured in Carbondale, Illinois USA. 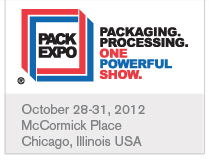 Pack Expo 2014 Nov. 2nd to the 5th McCormick Place in Chicago, IL. October 18, 2014 – Carbondale, IL – Com-Pac International, Inc., a leader in the design and manufacture of reclosable packaging solutions, will be exhibiting at Pack Expo 2014 this November 2nd through 5th, at McCormick Place in Chicago. Visit us at Booth #E-8141 (Lakeside Upper Hall) as our capable team will be available to answer questions and discuss the latest developments in the company’s extensive list of products and capabilities. Be sure to stop by Booth #E-8141 and see the many packages which use Com-Pac zipper and pick-up some samples for yourself! Status as of 3:30 am, 12/06/13 – All workers on 1st shift Friday should report for work as scheduled. Bitran®series of resealable, leakproof specimen bags used for short-term transport and long-term storage of lab specimens. Infecon®specimen shippers used for shipping all types of infectious and diagnostic specimens (including category A and B substances). Each shipper meets the appropriate 49 CFR/ICAO/IATA shipping regulations and instructions for both air and ground shipments. Saf-T-Zip®customizable specimen bags with the E-Z Tear opening feature, sequential barcoding and write-on block. Available with a 50 ml absorbent pre-inserted in each bag. Inspex® 95kPa specimen bags designed for transporting specimens which must withstand a maximum pressure differential of 95 kPa. The tamper-proof adhesive closure protects specimens down to –40° F.
New this year is our Saf-T-Zip Antimicrobial Specimen Bag and our Saf-T-Zip Biodegradable Specimen Bag. Com-Pac’s new Saf-T-Zip Antimicrobial Specimen Bags help maintain hygiene and prevent infection in today’s most critical healthcare environments such as hospitals, clinical and research labs, environmental testing labs and nursing homes. They’re safe, convenient and the material is FDA approved. Our Saf-T-Zip Biodegradable Specimen Bag helps hospitals, labs and other healthcare facilities reduce their environmental impact when they dispose of specimen bags. Both the zipper as well as the bag material are made from Enso® resin which meets the tough ASTM-6400 for biodegradability in all 50 states. All our Saf-T-Zip specimen bags are available with custom printing, thickness, sequential barcodes, the E-Z Tear opening feature and 50ml absorbents already in the bag. April 15, 2013 – Carbondale, IL – Com-Pac International, Inc., a leader in the design and manufacture of reclosable packaging solutions, will be exhibiting at United Fresh 2013 this May 15 – 16, at the San Diego Convention Center. Visit us at Booth #942 as our capable team will be available to answer questions and discuss the latest developments in the company’s extensive list of products and capabilities. Fresh-Cap Zipper Tape – Specially designed for Pac-Mac VFFS baggers, our new one-piece design provides superior internal closure strength with easy consumer opening and re-closing. Com-Pac International’s zipper rollstock is compatible with nearly all zipper application systems including Pac-Mac, Totani, Zip-Pak, Sunshine, Waterline, Hayssen, Bartelt, Bosch, Triangle, Ro-an, Hudson-Sharp, Park-Air, RD, Mamata and others. Be sure to stop by Booth #942 and see the many packages which use Com-Pac zipper and pick-up some samples for yourself! ThermoFisher Scientific National Sales Meeting in Tampa on February 12th and 13th. New this year is our Saf-T-Zip Antimicrobial Specimen Bag. Com-Pac’s new Saf-T-Zip Antimicrobial Specimen Bags help maintain hygiene and prevent infection in today’s most critical healthcare environments such as hospitals, clinical and research labs, environmental testing labs and nursing homes. They’re safe, convenient and the material is FDA approved. January 02, 2013 – Hospital, healthcare and laboratory environments are breeding grounds for bacteria, viruses, fungi and algae contamination. Microbes such as these can cause illness, infection, odor, staining and other contaminating effects within these critical environments. As part of our on-going activities to provide the most comprehensive solutions for specimen packaging, shipping and storage Com-Pac International has just introduced our all-new Saf-T-Zip® Antimicrobial Specimen Bag. Com-Pac’s new Saf-T-Zip Antimicrobial Specimen Bags help maintain hygiene and prevent infection and contamination in hospitals, clinical and research labs, environmental testing labs and nursing homes. They’re safe, convenient and the material is FDA approved. *Please contact us for a complete list. All of our Saf-T-Zip specimen bags are available with custom printing, thickness, sequential barcodes, the E-Z Tear opening feature and 50ml absorbents already in the bag. Com-Pac International, Inc., the manufacturer of Zip-N Squeeze® resealable feeding bags for patients recovering from maxillofacial, oral and other procedures which make the normal means for eating and drinking difficult, will be exhibiting at the 94th Annual Meeting and Exhibition of The American Association of Oral and Maxillofacial Surgeons this September 10th through 15th, at The San Diego Convention Center. Visit us at Booth #355 as our capable team will be handing out samples and answering questions about these innovative, convenient and economical feeding bags and accessories. Using Com-Pac’s patented leakproof, resealable zipper technology, Zip-N Squeeze is the simple solution to the challenges of hydration and nutrition of patients recovering from oral procedures. Post-operative swelling and pain make adequate nutrition and maintaining good oral hygiene challenging. The new Zip-N Squeeze helps to reduce recovery time and discomfort by providing an easy to use delivery system for liquid nutrition and rinses. Be sure to stop by Booth #355 and see the complete Zip-N Squeeze product line and pick-up some samples for yourself! Interested in purchasing Zip-N-Squeeze products? Visit our Zip-N-Squeeze catalog page here for more information or simply call 800-824-0817. Com-Pac International, Inc., a leader in the design and manufacture of reclosable packaging solutions, will be exhibiting at Pack Expo 2012 this October 28th through 31st, at McCormick Place in Chicago. Visit us at Booth #8422 (Lakeside Upper Hall) as our capable team will be available to answer questions and discuss the latest developments in the company’s extensive list of products and capabilities. Be sure to stop by Booth #8422 and see the many packages which use Com-Pac zipper and pick-up some samples for yourself!